Today, we announced that we're suing the president of the SPLC. Editor’s note: We on the dissident right are under siege. A number of major figures are battling bogus but expensive lawsuits stemming from Charlottesville. Others have been banned from social media or have seen their accounts restricted in various ways. Many sites, including TOQ and TOO, have been denied financial services that facilitate donations. Most devastatingly, people have been fired from their jobs as a result of a simple phone call from the Southern Poverty Law Center. Tom Kawcyznski, the author of this article, is one of those who have lost their livelihood and their reputation within their local community as a result of this evil. TOO has posted a review of Tom’s book, Someone Has to Say It: The Hidden History of How America Was Lost. 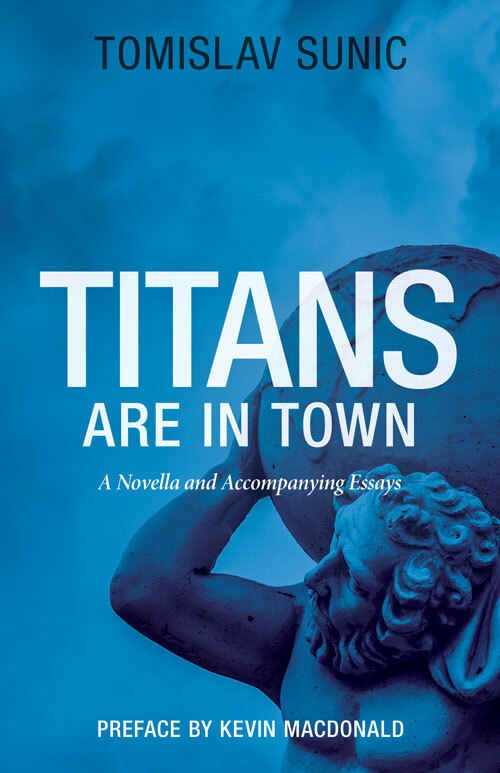 This book recounts his experiences in losing his position as town manager for Jackman, Maine, but also shows someone who has thought deeply about all the issues facing White America. Since his firing, he has been a fearless and honest warrior in our struggle. The good news is that there is increasing pushback against these efforts to stifle our ideas. Attorney Glen Allen has sued the SPLC as a result of being fired by the city of Baltimore. Jared Taylor is suing Twitter for banning him from the social media site. And the Center for Immigration Studies, a non-profit critical of immigration is suing the SPLC because the SPLC labeled it a “hate group” simply for criticizing immigration. If the legal system retains any integrity, all of these lawsuits have a good chance of prevailing. Of course, our legal system, like our other institutions, has been corrupted, so the outcomes of these cases are far from certain. Congress shall make no law respecting an establishment of religion or prohibiting the free exercise thereof; or abridging the freedom of speech, or of the press; or the right of the people peaceably to assemble, and to petition the government for a redress of grievances. Americans assume based on long practice and as a cherished principle that the freedom of speech, encapsulated within the First Amendment of our Bill of Rights, offers universal protection to free exercise of political opinions — provided the basic constraint that one cannot advocate for bodily harm to another. Our country has risen to international preeminence and global hegemony on this basis. The Internet, our latest and greatest contribution, has served as a powerful force for human liberation in thought and practice by spreading this understanding to new regions. Yet, for all the good it has done, never has this most basic freedom been under greater assault or in more perilous jeopardy. Knowledge is power. Those with knowledge have always recognized this truth and tried to keep awareness of what is happening in the world away from others who don’t share their interests. From the shamans of tribes, to the clergy of the Church, or the mandarins of an imperial court, restricting knowledge has ever been the way by which the powerful maintained their supremacy over the people. We imagine ourselves living in a world apart from those concerns, and our ignorance and apathy are enabling the creation of a censorship system so subtle and complete that we will not even realize it exists. The single recurring conspiracy in human affairs has been the willingness of those with power, especially when representing institutions with authority and substantial assets, to do anything to maintain their status. In our world, this represents a consortium of multinational corporations and the largest governments with which they constantly do business. For these actors, life is good, and the globalism promises a united tomorrow, more profits, and more power. It is only threatened by those nagging voices who cry out for the old ways: nationalists, racial identitarians, Christian traditionalists, and anyone else who holds principles that depart from the new consensus of materialism/consumerism/relativism. All are all targeted without respect to their ideologies. They are targeted if and only if they are seen as threatening the state/corporate duopoly. Here’s how it works: While recognizing the legal right to freedom of speech, the system, in every possible manner, makes an ever-increasing encroachment upon the exercise of that right. Financial, social, and legal obstacles are employed, not only to punish violators of the globalist consensus, but also to intimidate and suppress any would-be imitators from embracing such thoughts or actions. Because these efforts happen in a decentralized manner along every step of the process and because they are hidden by deceptive terminologies like the meaningless but ubiquitous label “hate speech,” the public is blind to just how egregious these actions are. Indeed, the public is actively discouraged from looking. The best way to demonstrate this is to show how many roadblocks make up this virtual gauntlet by going through the content creation process. Let’s start with you: Imagine yourself as a potential creator. At first glance, it would seem there are a world of platforms that can host your thoughts or media content. You know the big ones — YouTube, Facebook, Google, Instagram, Twitter, etc. Seeing all those producers going in a million different directions without any obvious constraint creates the impression that free speech has never been more successful. But such a perception loses sight of what we could call the signal-to-noise ratio. Should you want to produce content that is devoid of any overt political commentary, have no doubt your submission will gladly be added to the noise. But should you choose to comment negatively upon the campaign against national sovereignty, or globalist institutions like the big banks or the UNHRC, or the groups and people who are involved in promoting these institutions, the experience can prove quite different. Have you ever wondered where the best place to hide a book would be? Sometimes, the answer is in an enormous library, where the vastness of choice is presented as an opportunity. But with a perspective on quality of content, this mirage of vast choice can serve as nothing more than a pernicious distraction and illusion. Therein lies some commonality with the Internet: From its very inception, the Internet was imagined as a social engineering project, catalyzed with money from the Defense Advanced Research Projects Agency (DARPA) and utilizing cutting edge neuroscience from elite universities like Stanford and UC-Berkeley. Our government wanted the Internet to serve as a way to both propagandize people and to encourage them to reveal their inner truths and habits in a way they never would if a face was on the other side of the keyboard instead of a screen. That it has become an engine controlled by multinational private corporations promoting commerce in a global information economy could be potentially considered as the greatest side effect in human history. But there are powerful voices who have never moved away from the idea that the Internet exists not to express our ideas, but rather to shape them in a desired direction. When one begins producing content on the Internet, such concerns might seem laughable as you’ll be able to produce your first articles and videos and make your first connections with whomever you wish. There will be no negative consequences. If you make good content, others might begin to share the material. If you learn how to network socially, understanding that every name you see on Twitter or Facebook potentially represents a mind and heart you touch, you might even gain enough influence to warrant attention. This is where the game truly begins. Should your content be deemed anodyne and harmless, you’ll never even notice the censors exist. Write admiring articles on sports stars and Hollywood celebrities or take a left/liberal, globalist perspective, and the world is your oyster. Money in the bank. But should you question orthodoxy on the wrong subjects, or if you criticize the wrong groups or individuals, a series of funny things will happen. Where others get paid to produce whatever they create, your material will be selectively and arbitrarily demonetized. Where others can reach wide audiences, you’ll see how advisory warnings might be appended to your videos. Legitimizing verification status, like Twitter Blue Checks, will be denied or removed. Or perhaps your content might even be removed, your account suspended or banned. Deplatforming is a form of social ostracism that is so dangerous precisely because it is arbitrarily defined — why was Jared Taylor banned from Twitter but not, say, Richard Spencer? Yet there is a clear pattern to who is subject to this treatment: Those who seriously question the globalist consensus that dominates all the elite institutions of the West, public and private. Hate speech is nothing more than a label slapped onto any content that disturbs the interests of the status quo. However, the powers that be frequently define it instead as language that threatens another group — including not only violence but even the group’s self-esteem. Lost in this broad definition is a very important right we must defend — a right that is at the heart of why freedom of speech matters. If we cannot criticize those who have power over us, how can we resist or even offer dissent from what they intend? Accusations of hate speech have now aimed at protecting different categories of people from even the slightest criticism. One cannot comment upon the thoughts, actions, or behavior of individuals with a wide variety of group identities and affiliations without being accused of committing hate. For a White person to call attention to negative behavior of a Black person or to statistics on Black crime is racism. To comment upon what a gay does is bigotry. To comment upon what a Jew does is anti-Semitism. By this standard, reason itself has become hate speech, because certain identities are protected and are beyond criticism—without regard for the truth of the criticism — for fear of offending this ever-evolving social consensus. This new rule is not only enforced on the Internet, it is also enforced in society in general. Every public forum is constrained to follow the politically correct line that you cannot criticize any group that would take offense — apart from White males. This only proves how well those who make these arguments know the axiom attributed to Voltaire writing three hundred years ago: If you want to know who runs your society, look to whom you cannot criticize. Yet we celebrate this. We literally place certain people above others in a manner that is resulting in extreme political polarization and destroying the practice of employing reason to resolve conflict. My good friend Peter Jalajas, who runs Free Press Promotions, LLC, offers the perfect example: He created a mobile app called KosChertified? Grocery List + which helps educate consumers on the century-old food kosher-certification business while offering an embedded shopping database of products NOT Kosher-Certified (NKC). The product is entirely unique and received immediate approval by the Apple Review Team. Over time, it proved very popular in the ease of its functionality and the fact that it offered a win-win solution for both kosher-keepers and those who don’t seek out kosher seals (hekhshers). For those unfamiliar, countless manufacturers adhere to proscribed guidelines from one of over a thousand rabbinical organizations or kosher agencies to earn the right to put trademarked hekhshers on their product labels. These food companies pay for the religious certification services, but few consumers are aware of how prevalent it is. Peter thought people would be interested in knowing this information, so he built the app with judgment-neutral content to let people know the few products that did not have this certification — a faster and smarter solution than searching through databases of over one million products that do. Obviously, such information has no inherent bias. These are simply facts which can be observed and inform people’s choices. Any further conclusions would have to be based upon additional information that are far beyond the scope of this app or the relevant media he’s used for marketing. People have learned that they are not allowed to comment upon certain groups. And they have learned this lesson so well that we accept basic lies about our society. I experienced this myself when I made my own value judgment asserting that values of Islam — values that include having underage wives, treating women as chattel, spreading faith through violence and organized conceit, all of which would prove devastating to Western Civilization. Factually speaking, these arguments are easy to defend, and I always welcome such challenges. But we do not get to fight on rational grounds. Instead, because I commented negatively on Islam, I was stigmatized, and my comments were labeled as hate speech. I lost my job, my previous career, and my reputation. In both my case and Peter’s, people gave up their ability to reason and instead responded to social or legal pressures to suppress what had been written and to protect those who were deemed not only beyond rebuke, but beyond even making simple, obviously true observations about their religion. Such pressure is presented as a natural social outcry based upon public opinion, but this is another falsehood in this sordid process. The reality is that most of this pressure is artificially created, subsidized heavily by extremely wealthy interests like the Open Borders Foundation run by George Soros and a hundred other smaller foundations whose names you would likely not recognize, but which work in concert to achieve the same purpose. They fund the researchers and labelers who scour the Net to destroy any opposition to the globalist consensus. There is a whole nexus of news agencies and academics who serve as the means to accomplish these ends. One prominent example is RevealHYPERLINK “http://revealnews.org/”News.Org (Center for Investigative Reporting) which makes an effort to catalog people into perpetual internet infamy if they dare ask controversial questions. They do this with their Hate Report, and many targets fall prey to their coordinated attacks, from the KosChertified? App to Tucker Carlson. What you will never hear is how the research all starts with official university projects (e.g. www.MembershipPuzzle.org or www.PressThHYPERLINK “http://www.pressthink.org/”ink.org) run by well-endowed scholars (like Huffington Post contributor Prof. Jay Rosen of the Journalism Department at NYU) who are funded by the aforementioned non-profit organizations (or others like LuminateGHYPERLINK “http://luminategroup.com/”roup.com — “Building Stronger Societies”) specifically to seek out and to silence dissent. This information is then fed either directly to sympathetic journalists, most of whom work for supposedly independent websites like Reveal or for other media whose editorial boards and ownership already push this agenda. In order to make their findings seem legitimate, they also feed their findings to well-established NGOs like the Anti-Defamation League2 and the Southern Poverty Law Center that claim to monitor “hate.” There are many more such organizations, all of which deserve to be understood as the censors they are, and all of whom employ deceptive tactics to create the illusion of mass anger against dissenting voices. They utilize social media either directly or most commonly through proxy to whip up an angry mob against anyone who tries to use reason too effectively against the protected status of an interested party (think “Hate Sleuths,” such as the informants found at Reveal). They claim to be authorities, an assertion which none dare to challenge and their friends use to devastating effect. Should a person resist their onslaught, slanderous and malicious stories will be published, and a news campaign might be organized against them. It was a planted hit piece against me in a local paper which started the action which cost me my job. Then, unnamed and anonymous activists started calling and threatening local businesses, using social media to post lies about their services to extort the response they wanted from the town — nothing less than financially destroying me. They succeeded because, like the plague of locusts they resembled, the people who did not understand what was happening where I lived simply wanted them to go away. These organizations have learned how to focus brief outbursts of pressure to force compliance. They are the censors, and few can outlast them, especially when the mob is used as force to back up their decrees. No one wants to believe this is how politics and cultural commentary function in America today. But if you are a content creator who comes too close to questions the system does not want discussed, there are many tactics which might be employed against you and your family. Losing your job isn’t where the story ends. 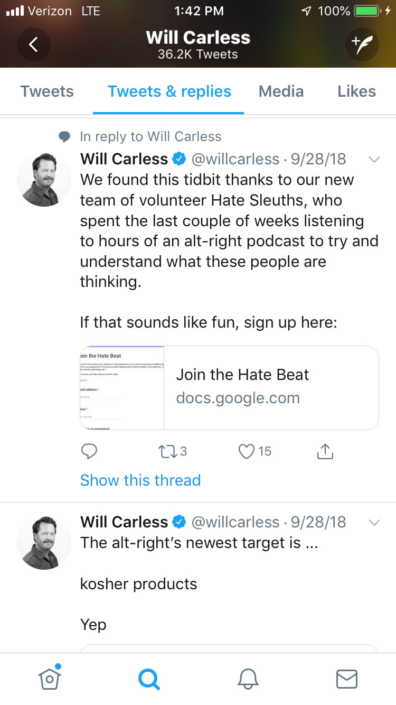 Hate monitoring groups will place you on atlases and report on you for the rest of your life, seeking to deny you gainful employment in any field. Crowdfunding sites where you could collect donations for either political or non-political causes will not allow you to participate, lest they be targeted. Media platforms will silence you. Even credit cards are now being banned from some people on the basis of their political speech. And amidst seeing all this stress, your real friends will sometimes abandon you, and you end up not just deplatformed, but depersoned. You are to be an example of what happens when one resists, and the extent to which they will go to punish you has no limits. Put aside all the labels. Put aside the literally billions of dollars rolled into a retribution and compliance machine. Look at the core questions we were asking and ask yourself: Do we deserve censorship? Did I deserve to be banned from even raising money for observing that Islam treats women in a way utterly incompatible with our existing law and practice? Do you deserve to be destroyed if you ask a forbidden question that might offend a group or a threaten a project promoted by the group? If you answer no to any of the above questions, then you too stand against this effort to use labels like hate speech in order to abolish reasonable inquiry into the major questions of the time. What you find as you research this nebulous term is there are very few times it is used to constrain people who genuinely and maliciously promote harm to others — an act most people naturally condemn. However, we find America’s Antifa groups enjoying the privilege of impunity after calling for and engaging in violence, while those asking the hard but legitimate questions of the day are ambushed. A better government would step in to ensure our freedom of speech is protected and that information on major media and social media platforms would remain content-neutral. But the extortion racket and intimidation machine has grown so powerful that among those who are aware — the few who stumble upon our forbidden books, websites, and social media posts — most choose to self-censor and avoid facing the wrath of the monster. But what happens, I wonder, when we stop asking questions and just give control over to people whom we can no longer comment upon or critique. What will constrain them from eliminating other rights we now enjoy? One need only look to China to see the future. They are now piloting a social media score where their people are judged according to right-think and wrong-think. If a Chinese person says and does the right things, they can enjoy all the benefits of society. Speak out, and they can find their ability to travel curtailed, their membership in organizations postponed, or perhaps even a re-education camp in their future. I wonder if we’ll have “mental health evaluations” in the U.S., because it’s not like we would ever do something like that here…would we? The future is coming faster than anyone realizes, and the person whom everyone wants to see silenced today might just be the ones who told you the scary truth about tomorrow. Whether you agree or disagree isn’t the issue here. What should matter is whether you believe their voice should be heard? Because if you say no, don’t expect anyone to be there for you when the censors decide that what you believe is now hate, even if it seemed the most natural thing in the world just a few short years ago. 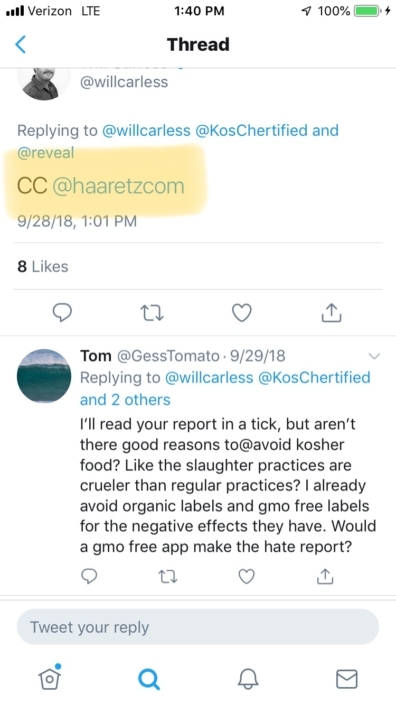 1 When both a Jewish journalist at the New York Daily News and the Jewish comedian he wrote about spoke harshly against the Kosher-Certification business, comparing it to mafia organized crime, there were no problems for either in the way that outsiders like KosChertified? were treated. The NY Daily News still has an app in Apple’s App Store even though their printed comments were many magnitudes more offensive than the benign critique made by KosChertified? Double standards? (See Cops force restaurants to cancel bookings of lesbian Jewish comic, Dec. 10, 2018). 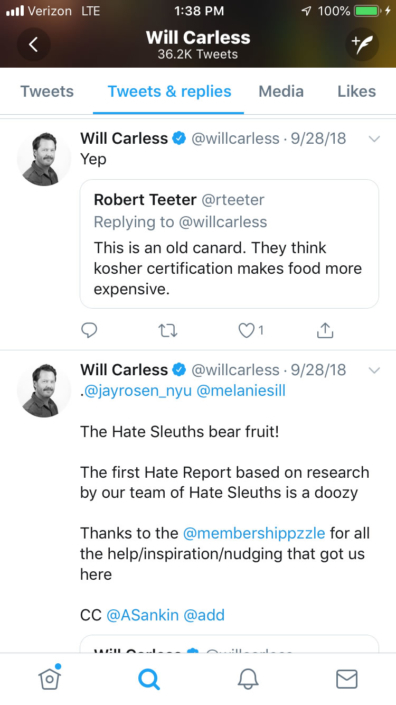 2 When RevealNews.org’s journalist Will Carless tweeted to his superiors about his new Hate Report victim, the KosChertified? 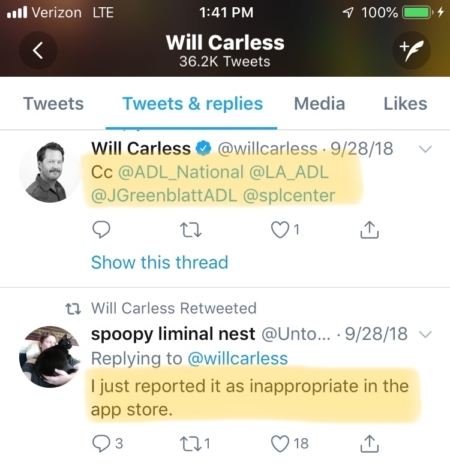 app, he made sure to cc three separate recipients at the Anti-Defamation League (ADL) in addition to the Southern Poverty Law Center (SPLC) and an Israeli newspaper. When public university UC Berkeley made a last-minute rejection of an ad in their campus paper, The Daily Californian, because it featured an image of Pepe’ the Frog, they cited the ADL as the source for labeling it as hate speech. When the private and Christian Pepperdine University of Malibu (California), published an ad from The Occidental Quarterly, a journal focusing on “Western Perspectives on Man, Culture and Politics,” into their campus paper, the senior editor publicly apologized in print the following week and sent a donation to the ADL in repentance…or was this tribute? The ADL is a common denominator in most activity related to the subject-matter of this article. 3 Apple immediately struck hard against the KosChertified? app, making unfounded accusations of fraud and rejecting appeals for compromise or modification; YouTube gave no warning strikes, a very unusual circumstance — and simply made a false charge of “commercially deceptive content” that violates their Terms of Service; this resulted in shutting down of his video channel.